University President Marc Tessier-Lavigne spoke at the Redwood City campus's recent groundbreaking (Courtesy of Stanford News). 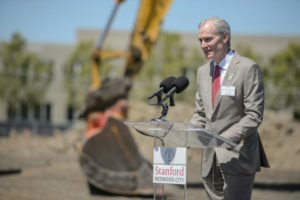 University President Marc Tessier-Lavigne spoke at the Redwood City campus’s recent groundbreaking (Courtesy of Stanford News). As construction for Stanford’s satellite campus in Redwood City officially broke ground several weeks ago, leaders of SEIU Local 2007, the union that represents over 1,200 workers at Stanford and Santa Clara University, expressed concerns that its members may not be hired to work at the satellite campus. The union worries that employees will instead be contracted out. According to SEIU Local 2007 Executive Director Francisco Preciado ’07, it has “not yet been made clear” whether the University will hire grounds workers, custodians and other staff from existing pools of Stanford workers. He emphasized that the University administration should follow through with its claims that Stanford will remain “one campus” throughout the expansion period. The Redwood City campus, which is targeted to open in 2019, will house approximately 19 percent of staff — or 2,700 Stanford employees — according to University spokesperson Lisa Lapin. Included in the relocation are employees from the Office of the Vice Provost for Teaching & Learning (VPTL), the School of Medicine, University Libraries, Business Affairs & CFO, University Human Resources (UHR), Residential & Dining Enterprises (R&DE), the Office of Development (OOD) and Land, Buildings & Real Estate (LBRE). Preciado expressed concern that these decisions will not prioritize or even include workers who have already been committed to Stanford for years, a possibility he described as contradictory to administrators’ assertions that Stanford will remain connected across both campuses. The director raised multiple concerns about the possibility of contracting work out rather than hiring in-house. First, he said, subcontracted work may not be unionized, which could deprive contracted workers of bargaining power. He also asserted that, whether unionized or not, contracting companies may not provide the same level of service as SEIU’s members and thus could have a negative impact on the University. The expansion plans — and Stanford’s General Use Permit (GUP) — have sparked other community questions over their potential to increase gentrification and traffic in the areas surrounding Stanford’s campuses. The 2018 GUP, submitted first in 2016, acts as an agreement between the county, the University and community partners to analyze and minimize impacts of Stanford’s development. However, some argue the effects of development must be watched more closely: A new coalition of student groups aligned with the union, the Stanford Coalition for Planning an Equitable 2035 (SCoPE 2035), has named the GUP and Stanford’s “future land use, growth, and development” as the main reason behind the group’s founding this year. Regarding worker benefits, Preciado also noted that relocating to Redwood City would significantly lower or eliminate parking costs for workers and make transportation much more feasible for some. On Stanford’s campus, workers pay for their own parking passes, which can amount to over $1,000 each year. For “mega-commuters” — those who must drive extreme distances to work each day, a growing population as the Bay Area becomes less and less affordable — the difficulty of driving, parking and paying takes a toll. In considering the relocation, Preciado said, the ability to park freely and easily is an enormous draw for workers. Lapin said no plans have been made regarding parking at the Redwood City campus. In recent weeks, union leaders met with the Provost to discuss the expansion and their hopes for work to remain in-house. Both parties noted that they appreciated the open dialogue throughout the planning process. Contact Fiona Kelliher at fionak ‘at’ stanford.edu.